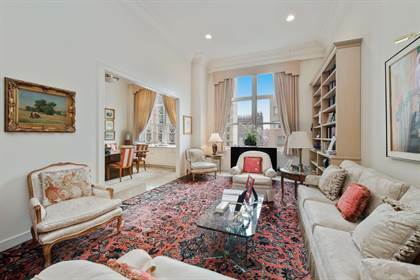 *Showings only in the afternoon*Majestic and luminous, unit P-14D is a unique apartment featuring palatial 14 ft ceilings and a formal layout reminiscent of a bygone era. The foyer, with its large walk-in coat closet, leads into the elegant living area decorated with custom-built libraries and crown moldings. The adjacent dining room can easily accommodate eight guests and is directly connected to the enclosed kitchen, which hosts the service entrance as well as the washer and dryer. The master quarters are separate from the rest of the unit. The spacious bedroom is replete with wall cabinets and a large walk-in closet, while the en-suite bathroom offers the luxury of both a bathtub and a separate shower, and is customized with a Toto bidet toilet. The other section of the apartment consists of two rooms currently configured as a cozy den and an elegant office, both with oversized windows. With two additional walk-in closets and a full marble bathroom, these rooms can easily be reconfigured to an owner?s liking. Park Avenue Court is a white glove building located in the heart of the Upper East Side: its amenities include a 24-hour doorman, a live-in resident manager, a gym with a yoga room, a pool, a kids? playroom and two outdoor areas. With the 4, 5 and 6 trains around the corner and Central Park only two blocks away, this address offers the convenience of a plethora of stores, restaurants and boutiques in its immediate vicinity. Demographic data shown in this section was gathered from the 2017 American Community Survey and is deemed reliable but is not guaranteed. No representation, guarantee or warranty is made as to the accuracy or completeness of information modified or aggregated for specific neighborhoods and/or zip codes. Hi, I'd like to find out more information about 120 East 87th Street. Thanks so much! By clicking the Contact Agent button, you consent to receive text messages, emails, and/or calls (may be recorded; and may be direct, autodialed or use prerecorded/artificial voices even if on the Do Not Call list) from Point2 Homes or our partner real estate professionals and their network of service providers, about your inquiry or the home purchase/rental process. Messaging and/or data rates may apply. Consent is not a requirement or condition to receive real estate services. You hereby further confirm that checking this box creates an electronic signature with the same effect as a handwritten signature.